Green Laker: Storm Of The Decade! One of the top news stories of late has been the deluge of rain, high winds and tornados (!!) that California has been receiving with a string of winter storms since Monday. With two storms giving us a total of 2.6" of rain at home since Monday, we're still high-and-dry. 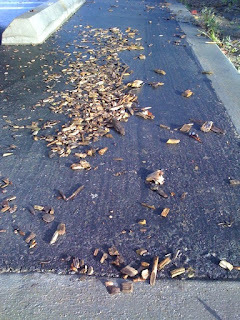 Same here at work, where the extent of the storm damage are a few errant wood chips littering the parking lot. Too bad the runoff also makes the water quite polluted. 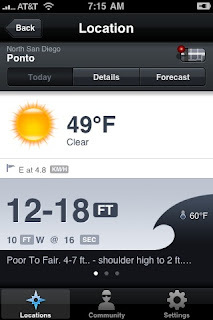 Not that I have any business heading out in 18' waves (or 8' for that matter). We're now just bracing ourselves for the next two which are supposed to pack a bigger punch. I'm just happy we don't live in an area prone to mudslides. Did the plastic lawn chair tip over this year? Not yet. We did take the added precaution of folding up the umbrella though. Doood. Sorry about the wood chips. We're having a bake sale for you tomorrow. Be strong.